Are you wanting to do a March Madness book bracket? I will show you how I successfully did this in Kindergarten and was able to get better writing out of my students! Last year, I had a handful of boys that were obsessed with basketball. In March, that’s all they wanted to talk about it. 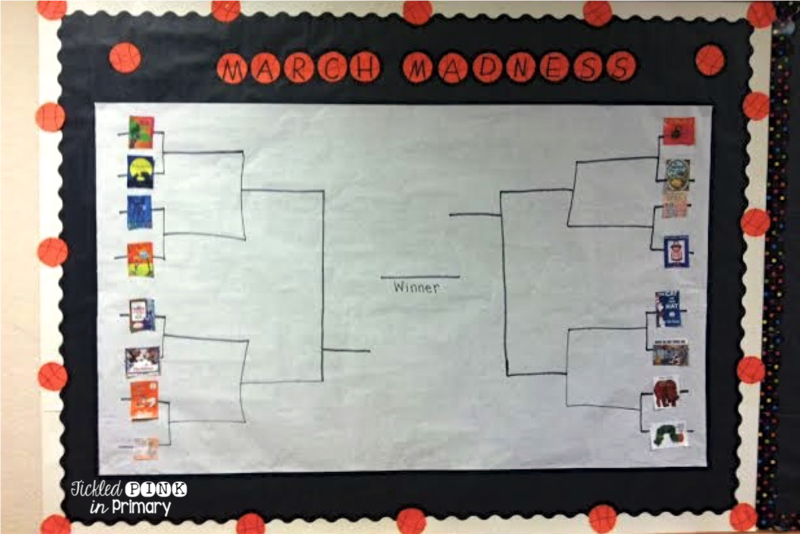 I was trying to think of a way to incorporate what we were learning with basketball to capture their March Madness excitement. 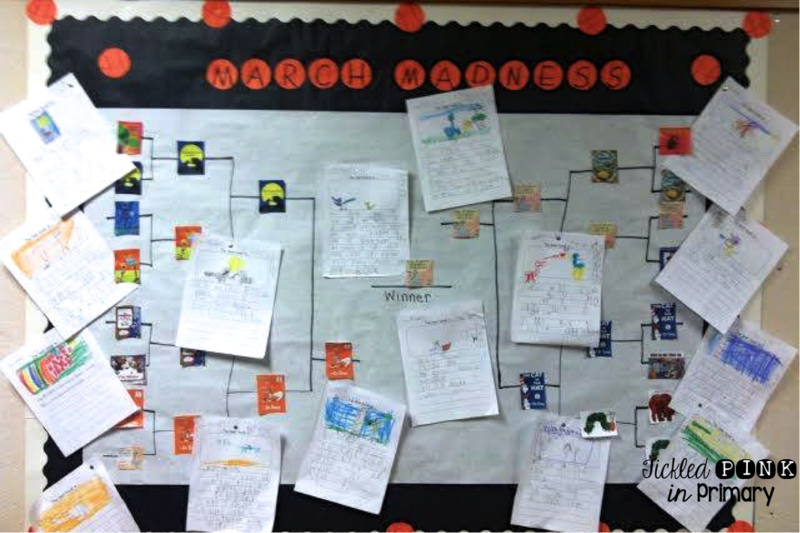 I thought about doing a bracket, but instead of basketball teams, we would do it with some of my class’s favorite books! I selected 16 books and created this March Madness book bracket below using the book covers of each book. Since we were working on opinion writing, I decided to use their opinion writing work as our deciding factor for which book would go on to the next level. For the top 16 books, I divided students into groups for each contest: Example: 4 kids choose their favorite book between Chicka Chicka Boom Boom or The Kissing Hand, 4 kids would write about The Rainbow Fish or No David!, etc. If I let students just write about their favorite book, there would probably be many books that didn’t have a opinion paper about them and then they wouldn’t be able to move on to the next level. To get their favorite book to move on to the next level, students had to write an opinion paper about their favorite book. I told them that I wouldn’t pick the book that has the most votes. Instead, I would choose the winning book based on whose paper told me details about their book AND convinced me that their book was the best. 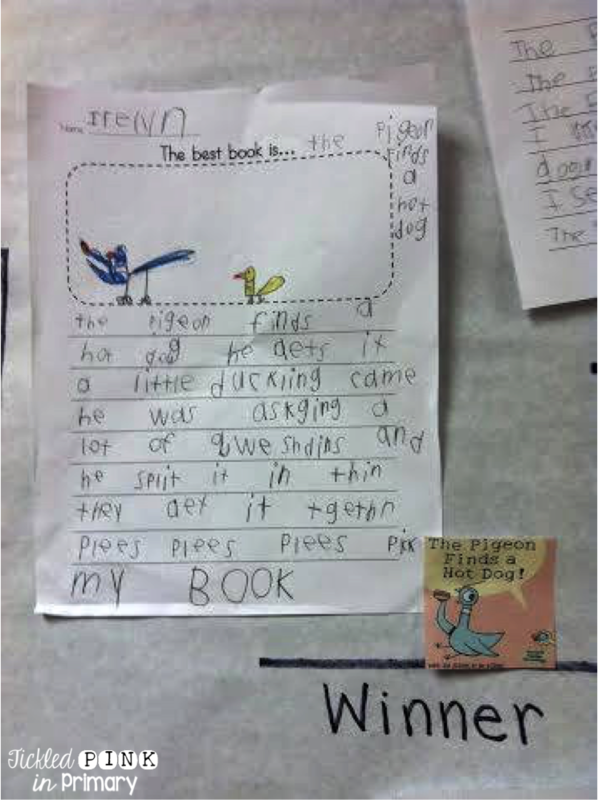 Opinion writing is a bit hard in Kindergarten, but they really had fun with this! Even my students that typically would only write 1 sentence, started writing more because they wanted me to choose their paper so their book would win! Grab this FREE writing prompt. As we got down to fewer books, I did let the students choose which book they wanted write about instead of my telling them they had to choose between 2 certain books. Each time I chose a winner, I posted the paper that convinced me to choose that book. My competitive class also liked this, because they wanted their paper to go up. This made them start to write more sentences, better details, and more opinions as the month went on. Notice the picture above “please please please pick my book”. LOL! The Pigeon Finds a Hot Dog was the winner!!! If you’re looking for more writing resources, check out my best selling Writing Center. There are some affiliate links in this post to help you better find some of the books my students love. This is an AWESOME idea and my teammate and I are going to start this next week with our firsties! Thank you for your great ideas!! You don't by chance have the writing page you used for this do you? 🙂 Thanks so much! Hey Wendy! So happy to hear you can use this idea in your school. Here's the link for the writing page.